Swacch Bharat Abhiyan was launched by the Government of India to achieve the goal of Clean India by educating the people both in Urban and Rural areas. 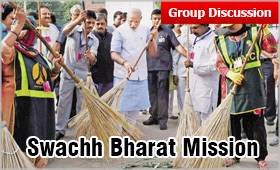 Named as Swacch Bharat Abhiyan by none other than the Prime Minister of India Shri Narendra Modi, the Clean India campaign was launched by him on October 2, 2014 at Rajghat, New Delhi. Swachh Bharat is a campaign that aims to clean up the streets, roads and infrastructure of India's cities, smaller towns, and rural areas. The key objectives of Swachh Bharat Abhiyan are: Eliminate Open Defecation by educating and motivating the people to construct toilets in their house and also by constructing community-owned toilets. The Clean India Mission is run by Government of India and has established in place an accountable mechanism of monitoring the community toilet use. Swachh Bharat Mission plans to achieve an Open-Defecation Free (ODF) India by 2 October 2019, the 150th birth anniversary of the Father of Nation Mahatma Gandhi. The target is to construct 90 million toilets in rural India at a cost of Rs.1.96 lakh crore. India has been suffering from poor state of cleanliness. People especially in rural areas and poor ones in urban areas prefer defecating in open causing spread of diseases in surroundings and to themselves as well. The sense of throwing the garbage into dustbins, not urinating in public has not yet been developed. Open defecation and sewage contamination of drinking and bathing water has been an endemic sanitary problem in India. In 2017, India was the country with the highest number of 530 million people resorting to open defecation. T he need was to change the mindset, improve health conditions, make the place liveable and improve the image of India. This called for an intensive drive to make and keep India clean. Swachh Bharat Mission is India's largest cleanliness drive till date with 3 million government employees, school students, and college students from all parts of India participating in 4,041 statutory cities, towns and associated rural areas. The mission contains two sub-missions: Swachh Bharat Abhiyan Gramin (Rural), which operates under the Ministry of Drinking Water and Sanitation; and Swachh Bharat Abhiyan (Urban), which operates under the Ministry of Housing and Urban Affairs. Swachh Bharat Abhiyan is to cost over Rs.620 billion. Government provides an incentive of Rs.12,000 for each toilet constructed by a below-poverty-line (BPL) family. Rs. 90 billion were allocated for the Swacch Bharat Mission in the 2016 in Union Budget. The World Bank granted a loan of US$11.5 billion and $25 million in technical assistance in 2016 for the Swachh Bharat Mission to support India's Sanitation initiative. The programme has also received funds and technical support from the World Bank Corporations as part of Corporate Social Responsibility initiatives. The Swachh Bharat Abhiyan has also received the funds and support from state governments under the Sarva Shiksha Abhiyan and other schemes. On 1 April 2000, the Government of India restructured the Comprehensive Rural Sanitation Programme and launched the Total Sanitation Campaign (TSC) which on 1 April 2012 was renamed "Nirmal Bharat Abhiyan" by then Prime Minister Manmohan Singh. The campaign conducted a random study of eighty villages in rural areas of Madhya Pradesh. It showed that the TSC programme could little increase the number of households with toilets, and had a small effect in reducing open defecation. There was also no improvement in the health of children. As part of the campaign, volunteers, known as Swachhagrahis, or ambassadors of cleanliness, have promoted indoor plumbing and the Community Approaches to Sanitation (CAS) at the village level. The Ministry of Railways has planned to have the facility of cleaning on demand, clean bed-rolls from automatic laundries, bio-toilets, dustbins in all non-AC coaches. The Centre will use its Digital India project in conjunction with the Swachh Bharat Abhiyan to have solar-powered trash cans, which send alerts to sanitation crew once they are full. The Swachh Bharat Swachh Vidyalaya campaign was launched by the Minister of Human Resource Development, Government of India by participating in the cleanliness drive along with the school's teachers and students. Non-governmental activities to achieve the objectives of the campaign include the national real-time monitoring and updates from Non Government Organizations (NGOs). Some of the NGOs are The Ugly Indian; Waste Warriors; SWaCH Pune (Solid Waste Collection and Handling) who are working to achieve the swacch Bharat goal. A film with a great message to transform rural orthodox mindset ‘Toilet-Ek Prem Katha’ was released and made a great impact on masses. Kunwar Bai Yadav of a village in Dhamtari District sold seven of her goats to raise the money to build a toilet at her house at age of 106 in 2016. She was declared a mascot of the campaign and was visited by Prime Minister Narendra Modi. Swachh Bharat Mission (SBM) Mobile App has been launched for use of the people and Government organisations to achieve the goals of Swachh Bharat Abhiyan. To make the Mission a great success, Government of India is spreading awareness among the people through advertisements. An extensive sanitation survey is conducted every year across several hundred cities to check the progress and impact of Swachh Bharat Abhiyan and to foster a spirit of competition among the cities. Till May 2015, 71 Indian public sector undertakings and 14 companies supported the construction of 89,976 toilets. In 2017, the national sanitation coverage rose to 65% from 38.7% on Oct 2, 2014 before the start of the campaign. It further rose to 90% in August 2018. Eleven states, 314 districts and 3.25 lakh villages were declared Open Defecation Free (ODF) by February 15, 2018. The cities and towns which have been declared ODF stood at 22 per cent and the urban wards which have achieved 100 per cent door-to-door solid waste collection stood at 50 per cent. The number of Swachhagrahi volunteers working across urban local bodies rose to 20,000, and those working in rural India rose to more than a lakh. The number of schools with separate toilet facilities for girls rose from 0.4 million (37 per cent) to almost one million (91 per cent). As per an independent survey released by Quality Council of India in August 2017, overall national rural "household access to toilet" coverage increased to 62.45 per cent and usage to 91.29 per cent, with Haryana topping the national ranking with 99 per cent of households in rural areas covered and usage of 100 per cent. Inspired by the Clean India Mission, a robot named Swachh Bot was built by a maker community in Chennai to clean the wastes on Besant Nagar Beach. Until 2017, India was divided into five zones for the purpose of Swachh Bharat survey and each city was scored on 19 indicators. The cities were classified into four colours: green, blue, black, and red, green being the cleanest city, and red the most polluted. None of the cities was rated as green—the best category in the exercise. During the 2017-18 senses survey, the parameters of assessment were diluted, and cities were categorised, based on population, into metropolis, large, medium, and small cities, and assessment took place according to this categorization to get at least some of the cities in the cleanest category. Corruption in ground implementation is again hampering the Swachh Bharat Mission. As per an independent Research report published by ABC Live Haryana, Disbursement of Incentives under Swachh Bharat Mission (Urban) in the state of Haryana has been made Arbitrarily by ignoring the guidelines of Swachh Bharat Mission (Urban). It could be happening in many other states too. Despite all the expenses on spreading awareness, advertisements, and huge public money being spent on Swachh Bharat Mission, it appears there is little headway. People are still resorting to littering, open defecating on Railways tracks, fields and other open areas. The Statistics and Data released by various agencies may not be accurate as ground realities are different. Unless physically verified the data may not support the facts. The garbage disposal plan, sewage treatment plan especially in big cities need to be well devised, otherwise it will be difficult to make the mission a success. Cities like Delhi, Mumbai, Kolkata have hills and mountains made of garbage which are waiting for concrete disposal plan. These mountains have also become a disastrous threat for the area as they emit poisonous gases and are highly inflammable. Jodie Underhill, the co-founder of Waste Warriors, a non-governmental organisation (NGO) headquartered in Dehradun, India, that specialises in waste collection and waste management, due to her contribution, has led the Indian media to give her the nicknames 'Garbage Girl' and 'Waste Warrior'. She is a British expatriate, and her work in India has brought her recognition in various forms such as the 'Brand Icon Award' by The Times of India and the 'Green Hero Award' by Center of Media Studies. एक कदम स्वच्छता की ओर (One step towards cleanliness) is the motto of Swachh Bharat Abhiyan. Cleanliness is both the abstract state of being clean and free from dirt, and the habit of achieving and maintaining that state. The success of the mission depends upon the collective efforts and not merely on criticizing the campaign by many of those who believe in speaking instead of doing positive.